4) Those who pray for the sheer joy of praying, seeking nothing. It is of the third category who are nishkama bhakthas, Arjuna has a doubt, which is expressed in chapter 6 of Gita. If such a bhaktha fails midway in his sadhana, due to distractions or due to intervention of death before he could attain Jivanmukthi, whether his sadhanas will go waste like a cloud torn asunder (6-38). Lord Krishna assures Arjuna that such sadhanas do not go waste and such a sadhaka takes birth in a good family, gets connected to the spiritual intelligence acquired in the previous birth and with that he strives more intensely for Realization (6-44). This we find in the life of some who even from an early age develop Ananya bhakthi or turn Ananya bhakthas suddenly at a later age due to Grace of God, even though they may be in category 1, which corresponds to the classification of Artha, Artharthi bhakthas of Lord Krishna in Gita (7-16). No doubt bhakthas in category 2 are also Artha, Artharthi bhakthas but they are karma yogis as well, as they have prasada buddhi, and accept happily whatever comes to them with the belief that God knows what is best for them and will only grant what is good for them like the mother towards her children. 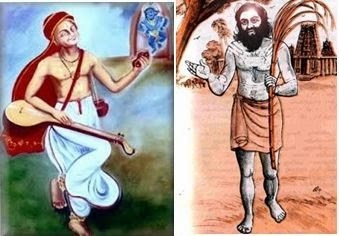 The sudden transformation that we spoke of in earlier paragraph is what we see in the life of Purandaradasa, whose birth-name was Srinivasa Nayak. He was born in a good family, received good education, got married at an early age of 16 and inherited his father’s gemstone and pawn business at the age of 20, when his father died. He became prosperous and was known as ‘Navakoti Narayana’. But he was a greedy and miserly merchant, who worshipped wealth. Once a brahmin came to him seeking help for conducting upanayanam-ceremony for his son. He made him come two or three times and then gave him a single coin of no value. Then the poor brahmin approached Srinivasa Nayak’s wife and cried telling what happened. She took pity on the poor brahmin and gave the brahmin her diamond nose-ring and asked him to sell it and use the money. This he then took to Srinivasa Nayak’s shop itself, sold it and went away with the money. Seeing the nose-ring, Srinivasa Nayak recognized it as his wife’s and so after giving the money to the brahmin he hurried home locking the nose-ring in the shop. When he confronted his wife and asked for the nose ring, she pretended to go inside and wear it. Instead she prayed to the family deity and then tried to drink poison to escape the wrath of her husband. To her surprise she found the nose-ring shining in the cup, which she wore and came out. The confused husband went back to the shop only to find the nose-ring there missing. He was all the more confused; and he came home and narrated this incident to his wife. She then told the whole story including the answer to her prayer. This was a turning point in his life. Not only he gave up his greed for money, but also gave away all his amassed wealth to charities. He became an ananya bhaktha of Lord and started a life of wandering minstrel singing Lord’s glory. His very first composition was about his regret for his wasted life of indulgence. The name Purandaradasa was later bestowed on him by the revered sage Vyasathirtha. Purandaradasa’s compositions are said to be more than 4 lakhs. The Saivite saint Pattinathar is another Artha, Artharthi bhaktha who suddenly transformed into an Ananya bhaktha through the grace of God. His birth name was Swetharanyar as he was named after Lord Siva of Swetharanyeswarar temple. He was also called as Thiruvenkadar by the people. He was born in a wealthy business family based in Kaveripoompattinam, which was a port-town. When he was five years old, he lost his father. He inherited his father’s business and expanded the import-export business. While amassing money he also did not hesitate to spend it on devotees of Lord Siva whom he fed daily. At the age of sixteen, he got married to a merchant’s daughter. He was also known as “pattinathu chetty” They had no children for fifteen years. Meantime there was a very poor devotee of Lord Siva, by the name of Sivasarumar who spent all his wealth in feeding the devotees of Lord Siva. When he ran out of money, he did not hesitate to sell his wife’s mangalsutra to feed the devotees of Lord Siva. As he was again running out of money, Lord Siva appeared in his dream and told him that he would find a baby at a certain spot and that he can hand it over to Thiruvenkadar who would give gold equal to the weight of the baby, with which he can continue his good work. Sivasarumar found the baby accordingly and took him to Thiruvenkadar, who had also got a similar message in his dream. Thiruvenkadar rewarded Sivasarumar with baby’s weight of gold and more, and adopted the child. Since Thiruvenkadar got the dream-message in Thiruvidaimaruthur, he named the child as Maruthavanan. If food is brought to the place where I am, I will take it. I will not go to any place for food even if invited or my body goes lean without food. After renunciation he sang many a philosophical song to enlighten people on the blissful state of renunciation. But that is another story. Great enunciation.! Lot of thoughts have gone in for such a nice presentation.